A tumour is a mass formed by an abnormal proliferation of cells. The term is used synonymously with neoplasia. The assessment of tumours is an important part of the role of a histopathology department and comprises a substantial portion of its workload. A tumour may be benign or malignant. A malignant tumour has the ability to invade from its tissue of origin and to metastasise to other organs. Metastasis is the process by which a tumour spreads in a discontinous fashion to a distant site by means other than direct extension. A benign tumour can neither invade nor metastasise. Malignant tumours are further divided into primary and secondary types. A primary tumour is one that has arisen in the organ in which it is present; a secondary tumour is one which has metastasised to reach the affected organ. For example, if a rectal adenocarcinoma metastasises to the liver this may be described as 'liver secondaries from a rectal primary'. A secondary tumour is synonymous with a metastatic tumour. The phenomena of invasion and metastasis are the defining features that distinguish a benign tumour from a malignant tumour, but there are other macroscopic properties of the tumour that may imply a benign or malignant nature. Benign tumours are usually circumscribed and have relatively smooth, regular edges. Their cut surface is generally uniform. Malignant tumours are normally non-circumscribed and can often be seen to be infiltrating adjacent tissue. The borders of malignant tumours are irregular. The cut surface may dislay necrosis, haemorrhage or cystic degeneration. This uterus contains multiple leiomyomas. Leiomyomas are benign tumours of smooth muscle. In the uterus they are well defined, circumscribed and have a light grey, whorled cut surface that is similar throughout each leiomyoma. 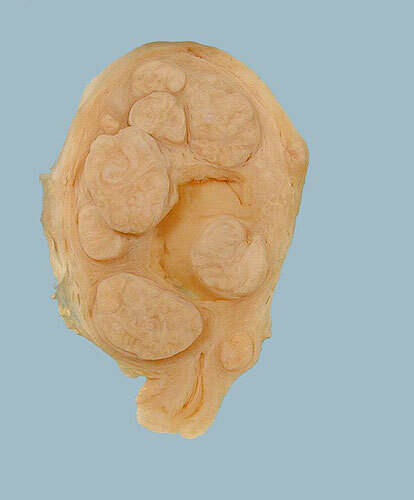 Although this uterus features two leiomyomas, the main tumour is a large mass on the right side of the picture. This tumour has a variegated, heterogenous cut surface and an irregular outline. This tumour was an endometrial adenocarcinoma. The precise mechanisms by which tumours develop are complex and the details and nuances vary between tumours. However, the basic theme is mutation of DNA. Mutations of the DNA of a cell may endow it with the ability to escape from the usual processes that regulate its growth and this is the essence of the formation of a tumour. Other mutations are necessary to allow these initial mutations to succeed in forming a tumour, further mutations may be required to enable the tumour to sustain itself at larger sizes (tumours need to induce the generation of a blood supply) and additional mutations are essential to permit the tumour to invade. Another cohort of mutations must occur for an invasive tumour to develop the properties that allow the tumour to metastasise. Cells which have acquired some of the mutations necessary to give rise to a malignant tumour, but not those that allow invasion and metastasis will remain confined to their tissue of origin. This stage in the development of a tumour is known as dysplasia; in some organs the term intraepithelial neoplasia is employed instead. Most tissues that show dysplasia are epithelial tissues. 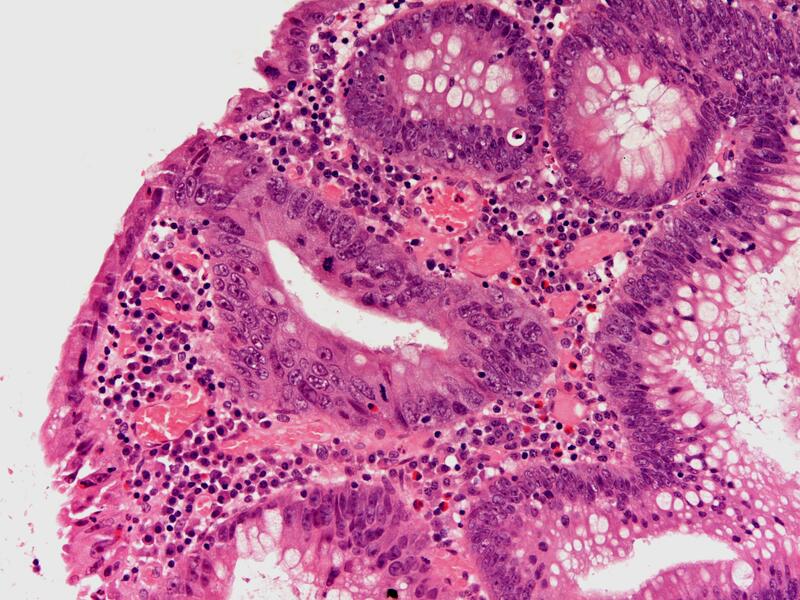 In some cases the dysplasia does not form a mass but alters the appearance of the flat epithelium. For example, Bowen's disease of the skin is a form of dysplasia of the squamous epithelium of the epidermis. It does not generate a mass but the affected skin will be red and often scaly. Even if the dysplasia is not associated with a mass, the dysplastic cells will appear cytologically abnormal and there is frequently associated microscopic architectural disorder of the affected tissue. These changes persist if the dysplasia progresses to a malignant tumour. The cytological abnormalities that are typically encountered in dysplastic and malignant cells are the morphological manifestations of the mutations and damage to the DNA of the neoplastic cells. These features are common to many types of neoplasia, although there are exceptions. Neoplastic cells have a higher proliferative activity than their normal counterparts, so mitoses will be encountered more frequently. In tissues which have an organised microscopic structure, such as the skin, the mitotic activity is normally restricted to a certain part of the tissue, such as the basal layer in the epidermis. The disordered proliferative activity in neoplasia overrides this organisation. The chromosomal composition of neoplastic cells, particularly malignant cells is frequently deranged. Aberrant numbers of chromosomes (aneuploidy) can result in abnormal mitotic spindles. Neoplastic cells have more active nuclei which contain more DNA. The nuclei therefore occupy a greater proportion of the cell and are a darker blue (due to the fact that haematoxylin stains DNA so more DNA will result in more haematoxylin being taken up). The nucleolus is the part of the nucleus where active DNA transcription is taking place and neoplastic cells are characteristically more active than normal. Pleomorphism is a variation in the shape and size of cells in a tissue or tumour. The disordered growth and mutated DNA of neoplastic cells means that the mechanisms which ensure that all cells that share the same function will be similar are disrupted and the cells can become pleomorphic. The glands on the left are normal glands. Those on the right are part of a tubular adenoma. The cells have large, hyperchromatic nuclei that are crowded and stratified. This high power view of a dysplastic large bowel gland demonstrates the prominent nucleoli of dysplastic cells. There is also stratification of the nuclei and an increased level of mitotic activity. The spread and metastasis of a neoplasm are features of malignant tumours only. Initially, a malignant tumour will spread by local invasion, at first through the tissue planes of the organ of origin, then into adjacent organs. Certain tumours have characteristic patterns of local invasion. As a malignant tumour progresses, it may metastasise. The chance of metastasis increases with the age of the tumour, possibily because older tumours have had more time to acquire those mutations that enable metastasis to occur. Older tumours are also usually larger and have more widespread local invasion, both of which increase the chance that the tumour has gained access to one of the routes of metastasis. There are several mechanisms by which a tumour may metastasise. Lymphatic dissemination. This will often result in lymph node metastases before deposits in distance organs. Vascular dissemination. The blood stream is ideal for carrying a tumour to a distant site. Perineural invasion. A tumour may invade inside the sheath of a nerve then along that nerve. Transcoelomic. This applies mainly to the abdominal cavity. A tumour may shed cells into the peritoneal cavity. These cells can then disperse across the cavity to reach a distant organ. 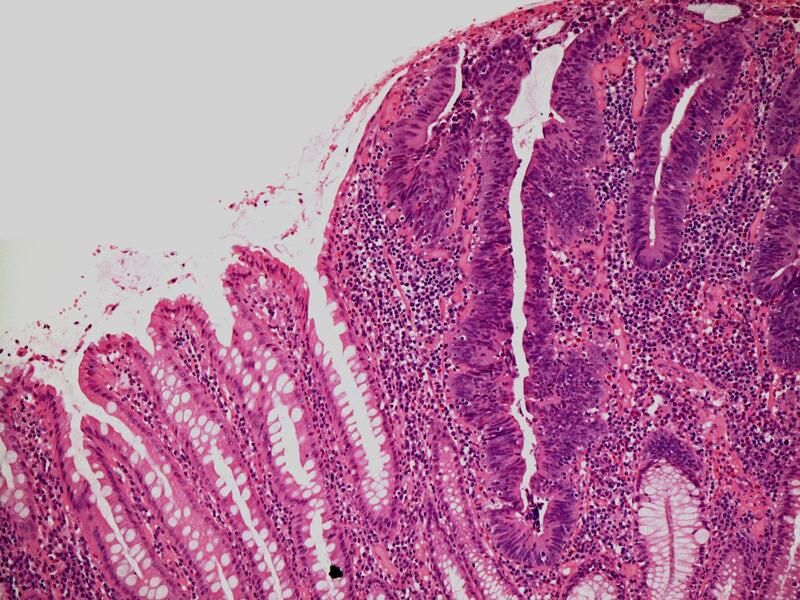 The most commonly cited example is gastric adenocarcinoma which metastasises to the ovary (the Krukenberg tumour). Malignant tumours typically have characteristic patterns of metastasis. Conversely, some organs also have characteristic susceptibilities to receiving mestastases from particular primary tumours or possess a general resistance to developing secondary tumours. For example, bronchial carcinoma tends to spread to the liver, brain, bone and adrenal. The kidney and myocardium are relatively resistant to metastases, except those of melanoma (infiltration by leukaemia can also occur). These consistent patterns can guide the search for a primary tumour in patients who present with metastatic disease. The stage of a tumour is a measure of the degree to which a tumour has spread from its point of origin and is therefore applicable to malignant tumours. The higher the stage of a tumour, the worse the prognosis. The malignant tumours of many organs are staged using the TNM system. The extent of spread of the primary tumour mass itself is assessed (T), the number of lymph node metastases of local lymph nodes is evaluated (N) and the presence or absence of distant metastases is noted (M). The details of the TNM system vary between organs and tumours. The TNM stage is usually expressed in the form T(number) N(number) M(number), for example T3 N1 M0. A p prefix is applied to the staging if it has been done pathologically. If one or more of the components is not known, an X is used (pT2 N0 MX). The stage of a tumour is usually the most important prognostic factor, frequently by a considerable degree from other parameters. The grade of a tumour is another significant prognostic parameter. 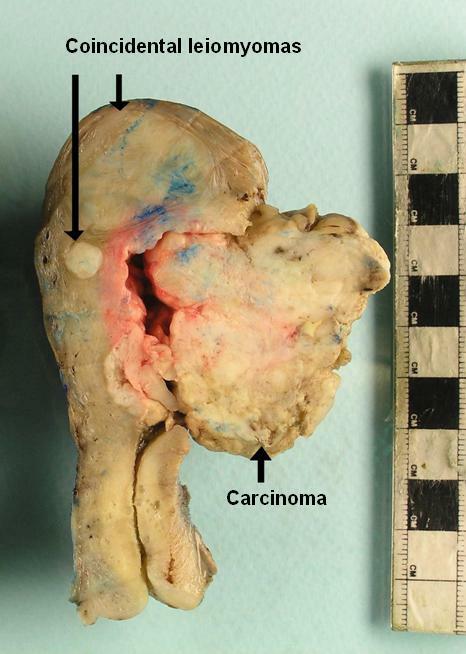 The grade of a tumour indicates how closely the tumour resembles its tissue of origin. The term differentiation is synonymous with grade for malignant tumours. A low grade tumour does not show many morphological differences from the normal tissue while a high grade tumour is markedly different. Higher grade tumours are more aggressive. Most grading systems have either two (low and high grade) or three divisions (well, moderately and poorly differentiated). Grading can also be applied to dysplasia. Most of the symptoms and signs that are produced by a tumour relate to the effects of the tumour mass. The precise features will vary depending on the organs affected by the tumour, but they reflect loss of function due to replacement and/or destruction by the tumour, additional manifestations of destruction (such as bleeding from mucosal tumours) and obstruction (a bronchial carcinoma can obstruct the involved bronchus, resulting in collapse of part of the lung, possibly with pneumonia as well). The simple presence of a mass may also be apparent to the patient or on examination. Tumours sometimes manifest paraneoplastic phenomena. A paraneoplastic phenomenon is a disorder that is caused not by the various physical effects of the mass of the tumour but is instead mediated by the release of a chemical substance, often a hormone, by the tumour. Small cell carcinoma is particularly prone to producing paraneoplastic phenomena. Hypercalcaemia is the commonest paraneoplastic phenomenon and can be induced by a variety of malignant tumours. As well as specific signs and symptoms which relate to the tumour, many malignant neoplasms can also produce general symptoms such as malaise, weight loss, anorexia and fatigue.